Home / Media Centre / FAQ / I forgot my password, what now? 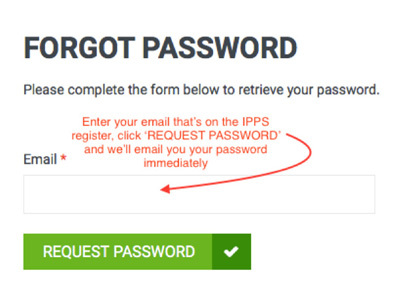 If you are a registered IPPS member and have forgotten your password, please follow these easy steps to recover the password. At the top right hand side of your screen, mouse-over the LOG IN button. Below the LOG IN button, you will see text that says "Forgot your password?." Please click the text. See the first screenshot below. You will now be taking to a page that will request that you supply the email address in the field that you registered with. Include your registered email address. Click on the REQUEST PASSWORD button. The website will now email you your password.